North Dakota Events, Coupons, Reviews! We all know the importance of having children in carseats and boosters, but without some kind of protection under their seat or booster, all those dropped cookies and Cheerios can make a serious mess. Plus, car seats and boosters have a nasty habit of digging and denting your fine upholstery and leaving a permanent mark on your backseat. What you need is some high end protection. 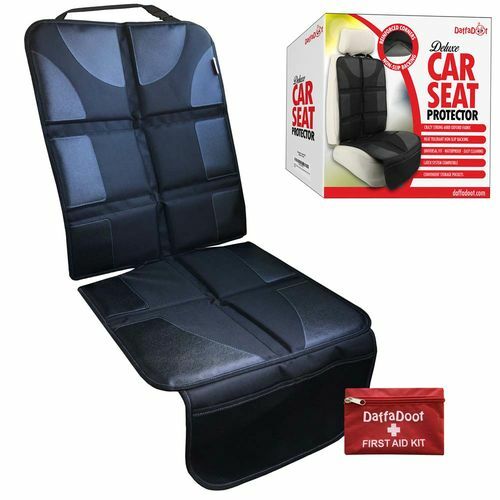 Our latest release, the Deluxe Auto Seat Protector is exactly what you need. Other mats or pads can't compete with our 14mm padding and heavy duty durability. Our neoprene non-slip backing grips like no other, and our Universal Fit with an extended "lock-down" bulb ensures that no matter what you drive, it's perfect for you and your kids. It's Full-Size, Premium Construction, with No Compromises. We've used only the strongest material and threads, and reinforced in ALL the right places. Many protectors provide only a sliver of extra fabric and claim to protect your seat, but we refuse to compromise on quality. It's evident from the first moment you take our protector out of its box. You will enjoy the premium feel, the superior stitching, and the quality fabric. Did we mention that it's anti-slip and color-fast? We even baked it in an oven to make sure it could take the heat. And it has spacious elastic storage pockets where you can keep things like diapers, pacifiers, bottles, sippy cups, toys, wipes...and yes, a bag of extra Cheerios. Bottom line, it's perfect for you and perfect for your little one. I received one of these car seat protectors and am pleased with it. I think the price is fair and reasonable. It will definitely protect my car's seat. Seems to be durable and should last a long time.